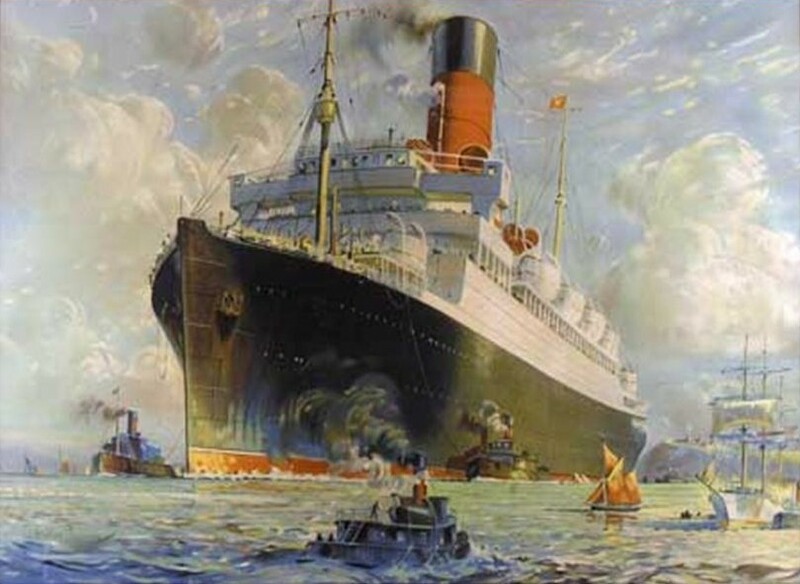 This inaugural poster was painted to introduce the Cunards Canadian service in 1922. It portrays Antonia off Quebec returning to England and is on display in the Anglo Boer War Museum in Canada. (Copyright Walter Thomas). 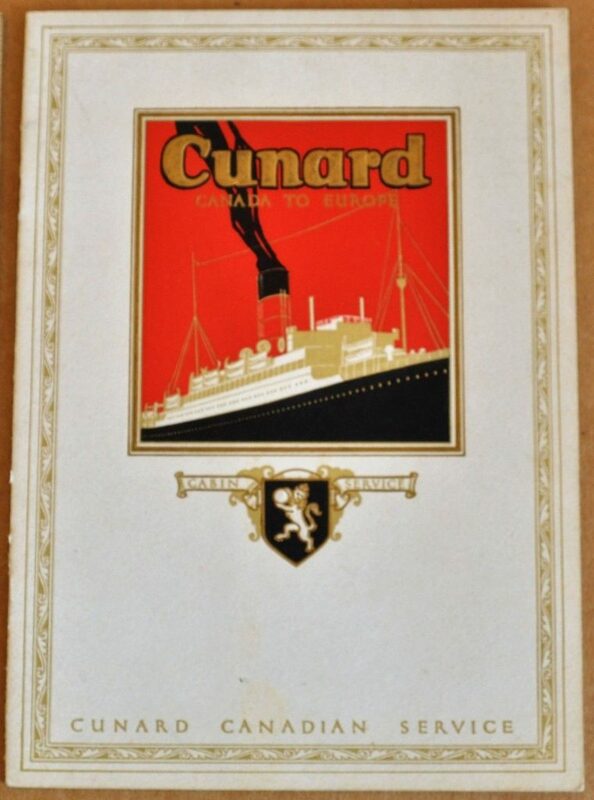 Cunard history – Founded in 1840 as the British and North American Royal Mail Steam Packet Company, the name was changed to the Cunard Steamship Company, Limited in 1878 but that was soon shortened to the Cunard Line. The first trip was made by the Britannia on July 4, 1840, in 14 days and 8 hours. Cunard sailed from Liverpool to New York and Boston with a stop, for some years in Halifax and then with Queenstown added to the route, for the mail service. By the 1880s, the voyage was taking less than 6 days, in the faster ships, from Liverpool to New York. 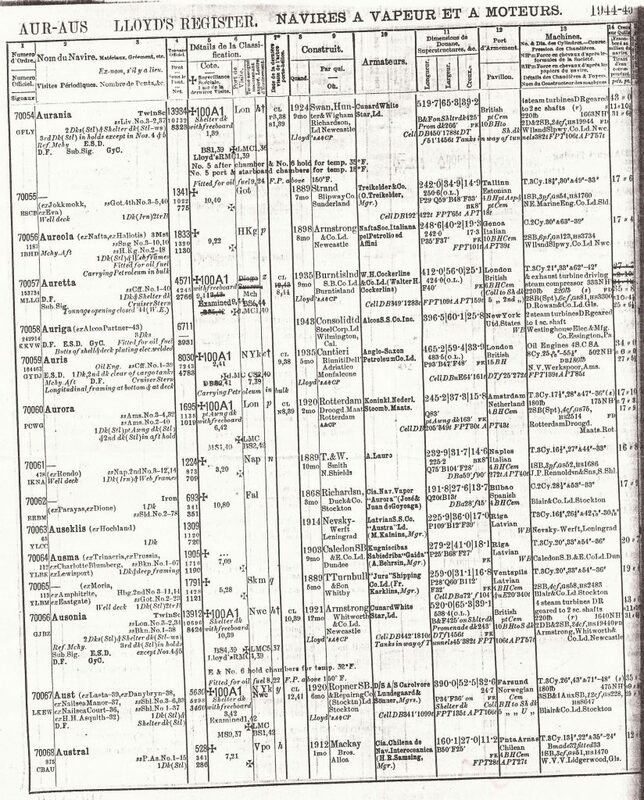 Cunard also added routes to various other countries. They ran weekly, sailing on Saturday, with their mail vessels and fortnightly, sailing on Tuesdays, with other vessels. In 1934 the Cunard and White Star Lines were merged forming Cunard-White Star Limited but White Star ships continued to sail under their own livery and are included in the White Star Line fleet list. Another name change took place in 1949 to the Cunard Steam-Ship Company Limited and, in 1962, to Cunard Line Limited. 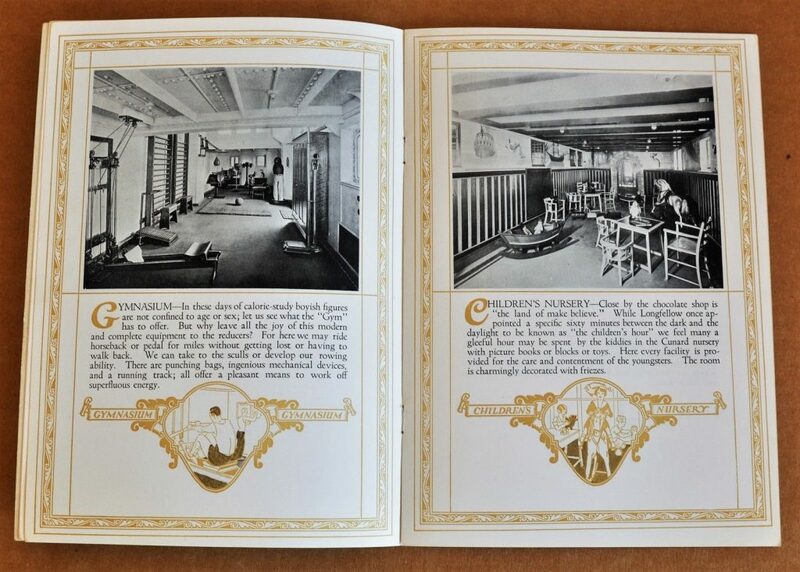 The rise in popularity of air travel caused the demise of transatlantic passenger ship travel and Cunard concentrated on pleasure cruising and cargo operations after 1970. In the years immediately before the First World War, Cunard started a new passenger service between London, Southampton, the French Channel ports and Canada. The service took advantage of a new treaty between the Canadian and French Governments, whereby goods shipped through a British port received a rebate. Five of Cunards newest ships, the Andania, Ausonia, Aurania, Alaunia and Ascania operated the service right up until the outbreak of the First World War. All five ships were lost during the conflict. Following their losses during the First World War, Cunard built eleven new “intermediate” passenger liners designed to bridge the gap between their small and sometimes vast vessels. Of the eleven, six were replacement ‘A’ class liners and the original names were used again. Built in two batches of three, the ships were essentially emigrant ships with a large refrigerated cargo capacity and were intended for the London to Canada route. The new ‘A’ class ships had particularly beautiful lines, with the first batch, known as the ‘A’ Class of 1922 and consisting of the Andania, Antonia and Ausonia, having island bridges, differing from the second batch, known as the ‘A’ Class of 1925 and made up of the Aurania, Alaunia and Ascania, which had continuous superstructures. 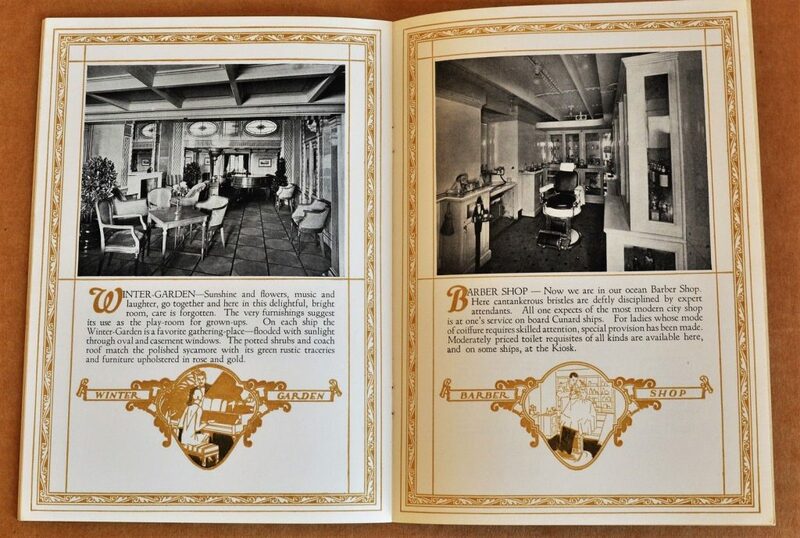 They had accommodation for between 400 and 500 cabin class and approximately 1,000 third class passengers and while they did not pretend to rival the luxury of the big express liners, the cabin class public rooms on A deck were spacious and comfortable. 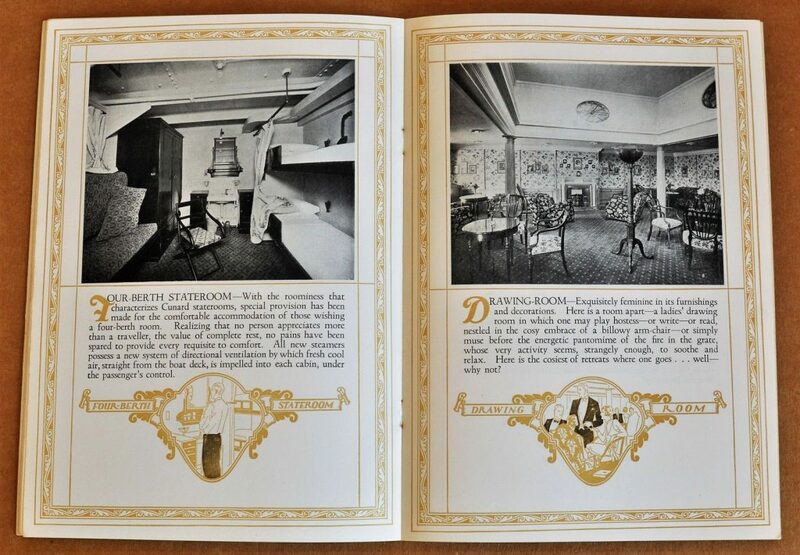 Forward of the main staircase was a winter garden lounge and aft of the staircase was a smoking room and a gymnasium. 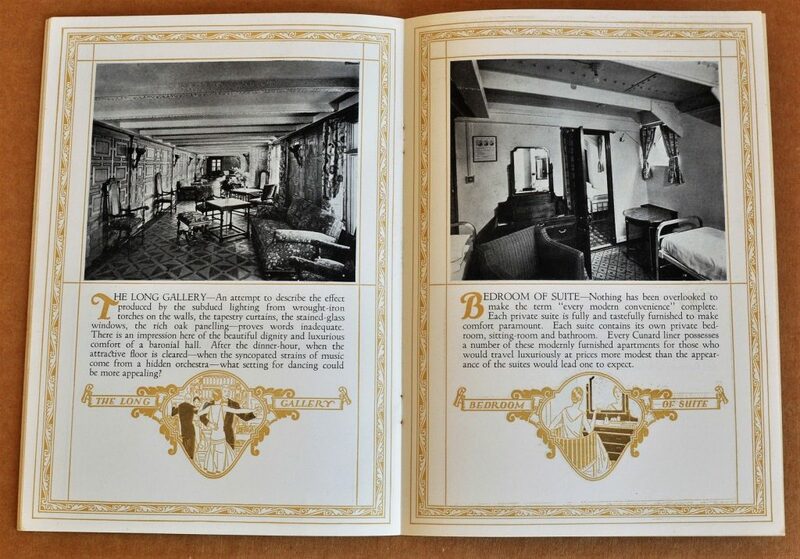 There was also a children’s nursery and a long gallery and drawing room. 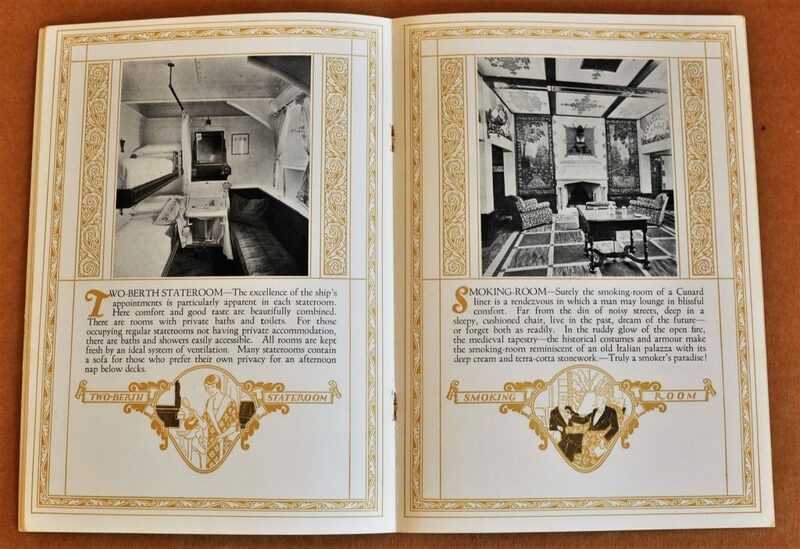 The third class passengers had two berth cabins and several recreation rooms including a lounge and smoking room. The ships were introduced in the closing years of the great age of emigration which lasted from 1830 to 1930. During that time, over 9 million people left Europe to settle in North America. In 1930 both the United States and Canada started to put restrictions on immigration, which effectively ended the great free for all when virtually any healthy person could settle in these countries. The new restrictions combined with the Great Depression, caused trade to drop off and in the early 1930’s several of the ‘A’ class had to be laid up for a short period. 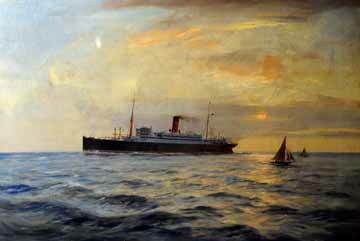 An oil painting on display in the Merseyside Maritime Museum depicts one of the ‘A’ class liners leaving Liverpool at sunset (Copyright Arthur J Burgess). In 1939, Britain was at war again and all six ‘A’ class liners were requisitioned by the Admiralty to be used as Armed Merchant Cruisers. 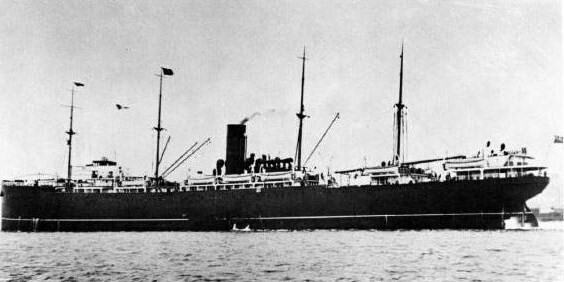 A few months later in June 1940 while on patrol off Iceland, the Andania was torpedoed and sunk, the only one of the ‘A’ class liners to be lost during the Second World War. In 1942, the Ascania was converted to a Landing Ship (Infantry) and then in 1944, into a troopship, a role she would perform until 1947, when she was returned to Cunard, the only ‘A’ class liner to do so. In 1942 approval was given to convert four of the former Cunard ‘A’ class liners into Fleet Repair Ships, Antonia was to become HMS Wayland, the Aurania, HMS Artifex and while both the Ausonia and the Alaunia were converted, they kept their former names. Royal Navy Fleet Repair Ships usually consisted of a motley collection of vessels of all shapes and sizes and to have four ships of one class in this category was unusual if not unique. 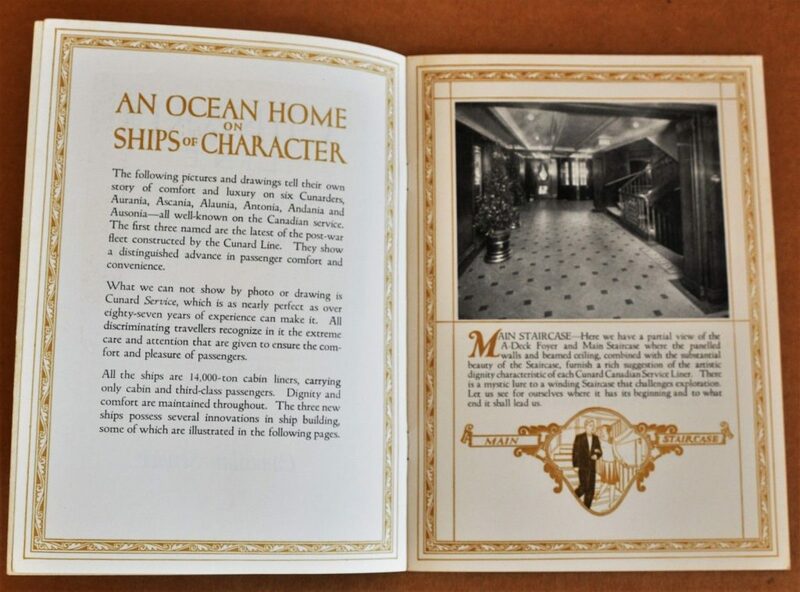 All six ships of the Cunard ‘A’ class were built and fitted out to the same standard. It should be mentioned that seven ‘A’ class ships were originally projected but the design was significantly changed after the first of the class, the Albania, was built in 1921. The Albania was the first passenger ship to be built for Cunard after the end of the First World War, but she did not prove satisfactory and was laid up after only four years service, being eventually sold to an Italian passenger line in 1930. Renamed the California, she was used by the Italian Government as a hospital ship, a role that she was performing when torpedoed and sunk by RAF aircraft at Syracuse, Sicily, in August 1941. 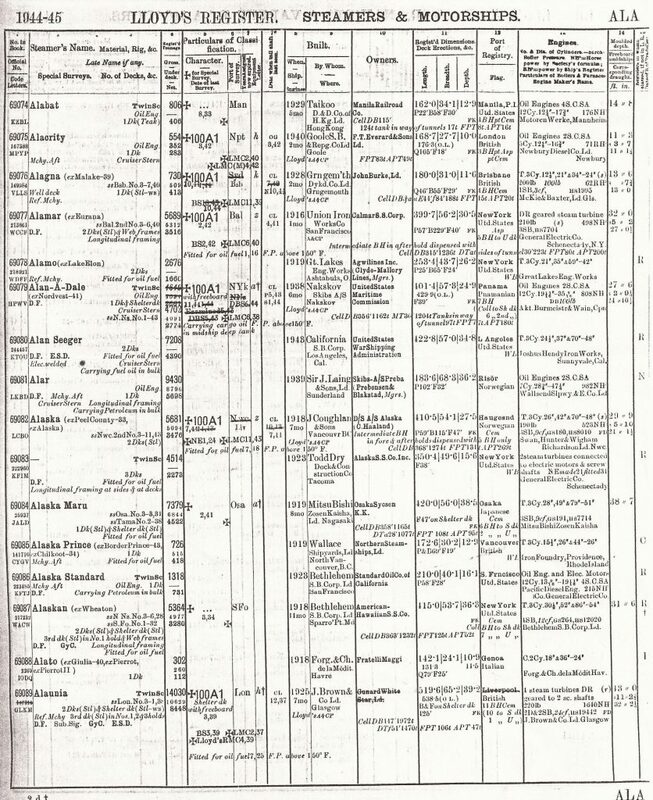 Photocopies taken from pages within the 1944-1945 Lloyds register listing the particulars of numbers 69089, Alaunia, 70054, Aurania and 70066, Ausonia. 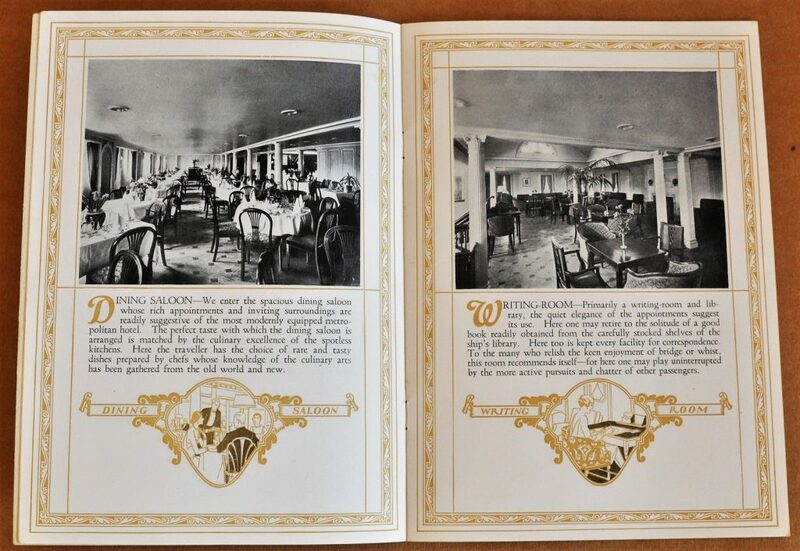 The Alaunia has already been brought outright by the Government but the Aurania and the Ausonia are still listed as being owned by Cunard White Star Ltd. 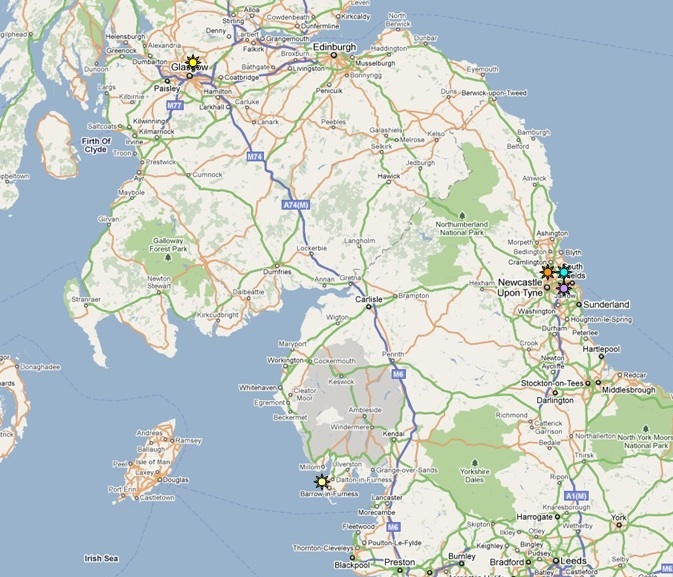 The above map shows the location of the five shipyards that built the ‘A’ class ships. 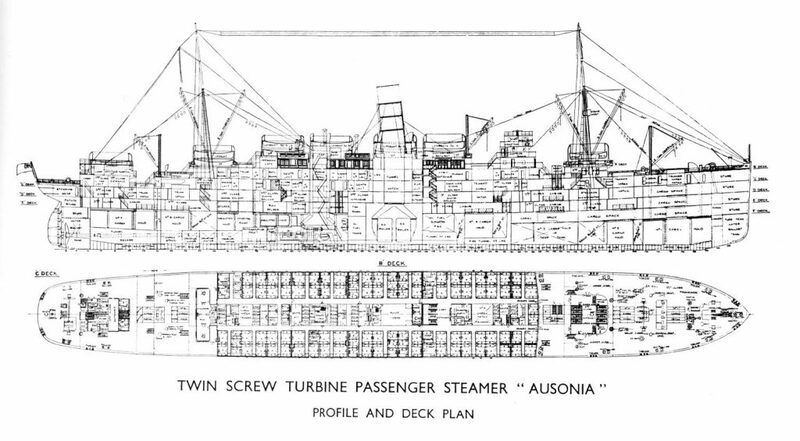 The profile and deck plan for the Twin Screw Turbine Passenger Steamer Ausonia has been taken from the Tyne Built Ships website (copyright belongs to the Newcastle City Libraries) and is interesting as it shows a plan of the accommodation space, which was all removed when the ship was converted. 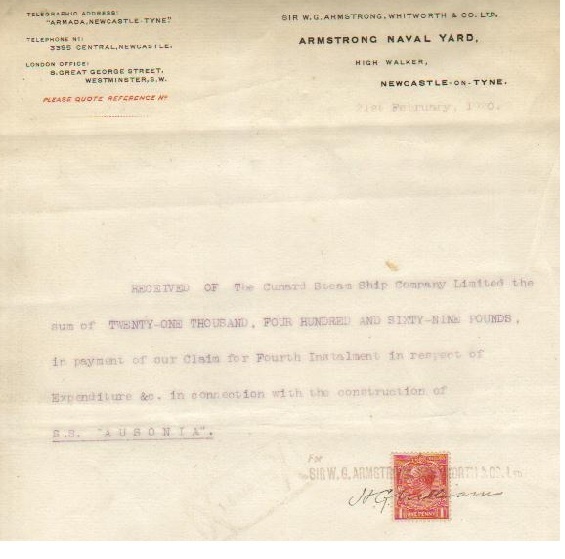 Ascania (Cunard) Receipt issued to Cunard Line from Armstrong Naval Yard in the amount of £21,868.0.0 as payment of 4th instalment of constructing the liner. Dated 21 Feb. 1920. One Penny tax stamp affixed. 8.5×13.5″. 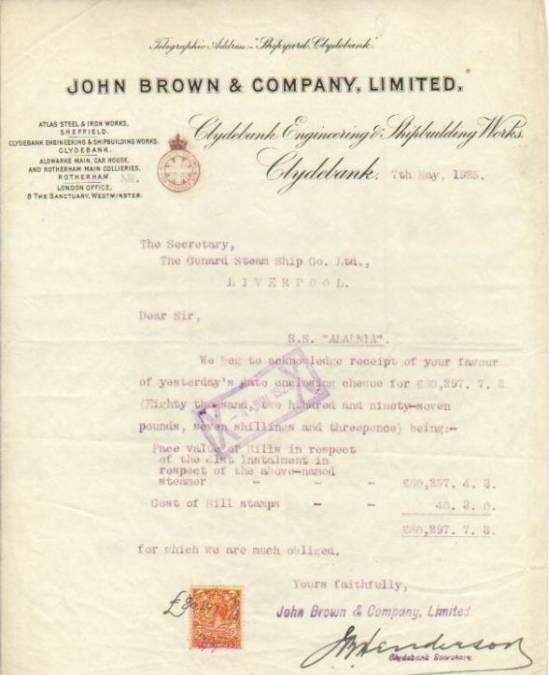 Alaunia (Cunard) Receipt issued to Cunard Line from John Brown & Co. Ltd. in the amount of £80,297.7.3 as payment of 41st instalment for building the ship & bill stamps. Dated 7 May 1925. Two Pence tax stamp affixed. 8×10″. 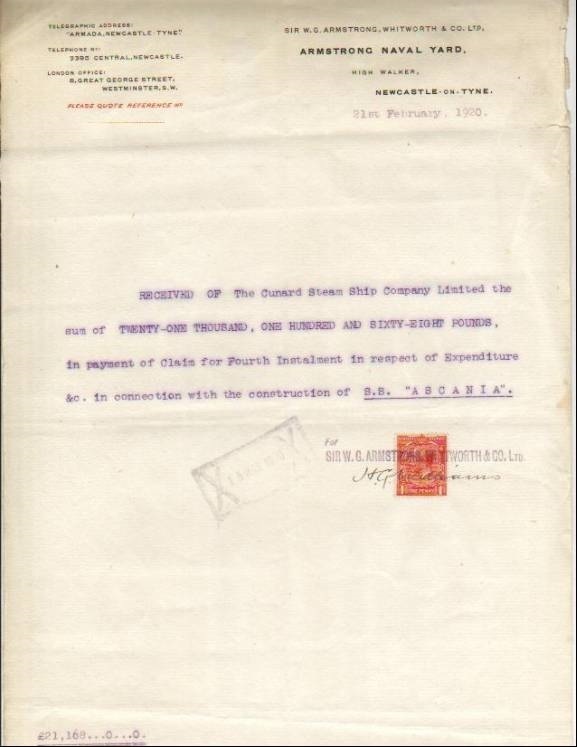 Ausonia (Cunard) Receipt issued to Cunard Line from Armstrong Whitworth & Co. Ltd. in the amount of £21,469 as payment of 4th instalment for building the ship & bill stamps. Dated 21 Feb 1920. Two Pence tax stamp affixed. 8×10″.